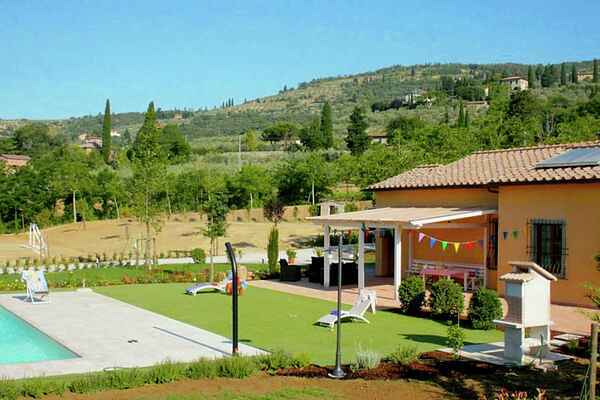 Villa Fiore is the ideal place to have a relaxing break immersed in nature. The Villa is surrounded by olive trees of over two hectares and has stunning views of the nearby medieval town of Castiglione Fiorentino. It 'was recently renovated by the owners who have personally followed the work to make the modern and welcoming environment, thinking of a structure that can meet both the needs of children and adults. The outdoor spaces are large where, you arrive at the villa, passing through olive groves, along the boulevard leading to the car park. The villa is on one floor and can accommodate up to 6 people; directly overlooking the beautiful full deck pool, solarium and parasols to enjoy the Tuscan sun in peace and quiet. Also on the outside has been set up a beautiful and large veranda with table and benches, thanks to the nearby barbecue, it will be ideal to enjoy your meals outdoors. Complete the veranda a small sitting room with sofa and armchairs. Villa Fiore has a special focus on your children: in fact, the owners have created places designed for their enjoyment in fact there is a beautiful soccer field and beach volleyball courts that give you some carefree moments with your kids and why not, to adults!